RFID technology is divided into three categories – Passive, Semi-passive (also called battery assisted passive or BAP) and Active – based on how the tags obtain power and how they use it to communicate with the interrogator. More technical details regarding differences between these three categories are discussed on our Explore Portal. What are the technical differences? The passive RFID tags have no internal power source and they draw the power from the RF waves sent by the interrogator. They communicate with the interrogator by reflecting and modulating these waves, which results in relatively short read ranges from a few inches to approximately 15 feet. Their memory is limited. The active tags on the other hand, have their own power source (a battery) and a transmitter and use these two components to broadcast the information to the interrogator (they can broadcast even when the interrogator is not present, this is called beaconing). This type of tags can communicate over hundreds of feet and have very large memory. Semi-passive tags are somewhat of a hybrid of these two types of technology. They have a power source but no transmitter and the battery is used to aid the communication. The signal from the reader is still reflected, however, the battery powers the chip, so it does not need as much energy from the reader, which allows to respond even to weaker signal and results in longer read ranges than what could be achieved with traditional passive tags. Read range for semi-passive tags could be counted in dozens of feet and they can have also extensive memory. What applications is each type of tag used for? Because passive tags have the lowest cost of these three types, they are commonly used to tag high volumes of items in applications that will not require long read ranges. Because passive tags utilize multiple frequencies, that result in different tag performance, their applications also differ by frequency. Passive Low Frequency (125 kHz) tags have very short read ranges but very good penetration of liquids and moist materials. They are commonly used for animal tracking (livestock and pets) as well as in car immobilizers (the tag is embedded in the key). Passive High Frequency (13.56 MHz) tags have also quite short read ranges (around few inches) and also good penetration of liquids and moist materials. They are perhaps most used tags in general as they are used for access control cards. Another application is tagging pharmaceuticals, library books or laundry. Lately you have probably heard about NFC (Near Field Communication), which is a type of RFID and also utilizes High Frequency and some of the same standards. NFC is widely used for touchless payment. You can find examples of HF and NFC tags here. Passive Ultra High Frequency (860-960 MHz) tags have the longest read ranges of all passive tags (up to 15 feet, sometimes more) but do not penetrate water or moist materials. They are most commonly used for inventory control and supply chain management of goods, parts and materials, and for case and pallet tracking in retail, manufacturing, pharma, logistics, military and other industries. 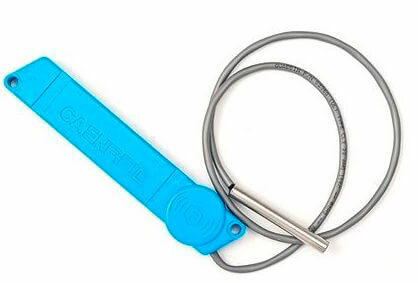 Passive tags are also used for asset management that includes computer and IT asset tracking, furniture, equipment, uniform and laundry tracking; and returnable asset management in manufacturing, healthcare, logistics and other industries. Passive tags can be also used for personnel tracking, patient tracking and event management. Passive tags in very small form factors can be also used for anti-counterfeiting. 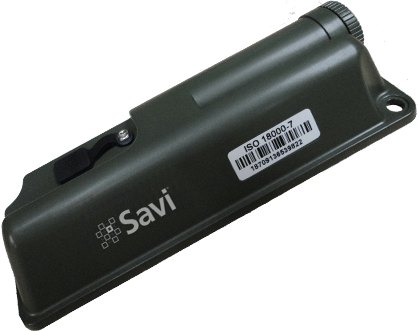 Within passive UHF there are also Near Field tags that utilize the near field and these have read ranges only a few inches. Their advantage is usage of same protocols and frequency as far-field UHF combined with good penetration of liquids and moist materials and short read range. Great examples of passive UHF tags are here and here. Passive Microwave Frequency (2.45 GHz) tags are the least common within the passive family, however, they are used for inventory tracking and various applications that do not require long read ranges but have a need for very fast data transfer rates. This frequency is more commonly used for active RFID applications. Active RFID tags are the most expensive of the three types, however, they also provide the longest read range counted in hundreds of feet and they are best used for high value assets. Because they have a transmitter within a tag, the signal is very strong and can bounce and reflect off of surrounding materials, therefore this technology provides very reliable reading over long distances and in difficult environments. 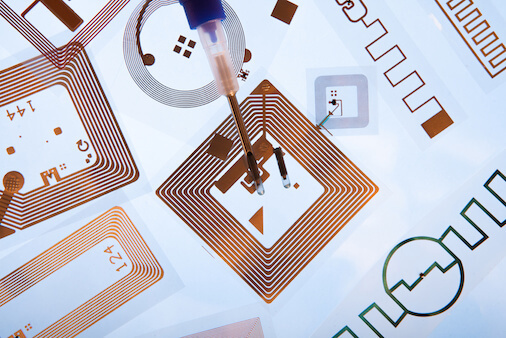 Active RFID tags most often come in two frequencies and their performance differs mainly by the data transfer rate (the higher the frequency the faster the rate), memory, sensors and usage. Active tags that are most often used (and deployed by the U.S. military) are the ones operating at 433 MHz, under the ISO18000-7 protocol. These tags are used to track pallets and containers as well as large military assets. In commercial sector, these tags are used in logistics, tracking land and ocean containers, vehicles and other large and high value assets. Active Microwave Tags (2.45 GHz) are often used for toll collection as well as Real Time Location Systems (RTLS) for locating assets within a facility such as a warehouse, a hospital, or an office building. There are active tags that utilize also other frequencies, which are much less common. Some tags use UHF frequency (915 MHz) for active technology and they are used for logistics and container tracking, personnel tracking and asset location. Active RFID tags due to the presence of the battery can carry sensors (such as temperature, humidity, or intrusion), LEDs, buttons and perform various functions. Such tags are used for temperature tracking in refrigerated trucks for transporting produce and frozen goods, temperature tracking of lab samples and pharmaceuticals, or intrusion tracking in sealed containers. They can be used for picking – the tag’s LED lights up when item is to be picked – this can be used for logistics, pharmacy operations, etc. Semi-passive or BAP tags often use UHF frequency and protocols that are same as passive UHF, therefore, they can be read by regular passive UHF interrogators. The advantage is longer read range and also possibility of sensors, most often a temperature sensor, as well as higher memory than passive tags. You can see some great examples here. These tags are often used to track high value assets, track and monitor temperature sensitive products like perishable foods and pharmaceuticals, during transportation and storage, and track chemicals and other industrial products. No matter your application, there is a suitable RFID technology for you. If you’d like help with picking the right one, let us know! Check back for next post that will go into Active RFID applications more in detail!